Larger barges can carry nearly 14,000 tons, the equivalent of 500 truck loads. The U.S. Army Corps of Engineers recently held an Oregon Coast Jetties Industry Day, gearing up for a series of jetty and breakwater projects expected to keep construction crews working through 2022. 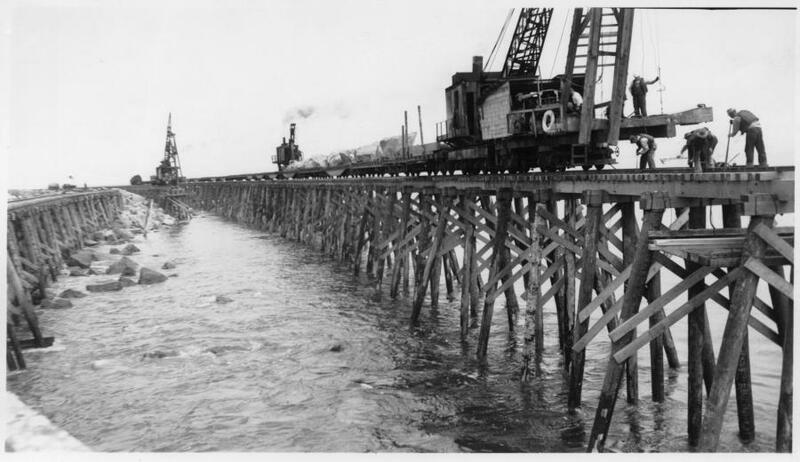 The projects include the complete rehabilitation of three jetties at the mouth of the Columbia River; repair of the Tillamook Jetties; the Coos Bay North Jetty; and the Port Orford breakwater. Jetties help stabilize the bar, that place where the ocean collides with the flat water of the bay, by creating a channel for boats to transit and also by allowing the water to carry sediment out to sea, reducing the need for dredging. The bar is generally considered the most dangerous place for a boat going out to sea. 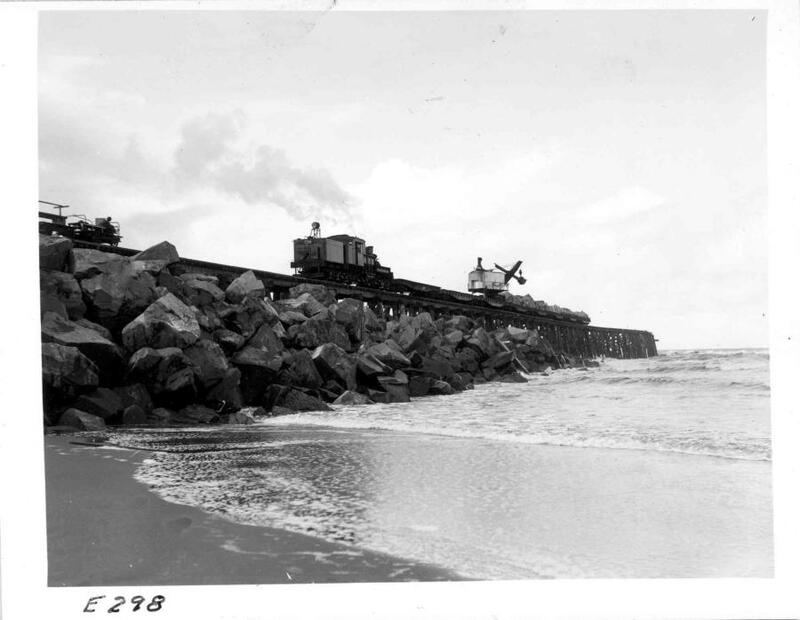 The jetties on the Columbia River, originally built in 1885, transformed the mouth from a 5-mi. opening to a 2-mi. opening. More than 2,000 ships have been lost at the mouth because of the unpredictable bars. Jetties are built with tons of massive armor rock on the exterior and smaller rock, of lesser quality on the inside. It's an effort that takes time, planning and many, many millions of dollars. 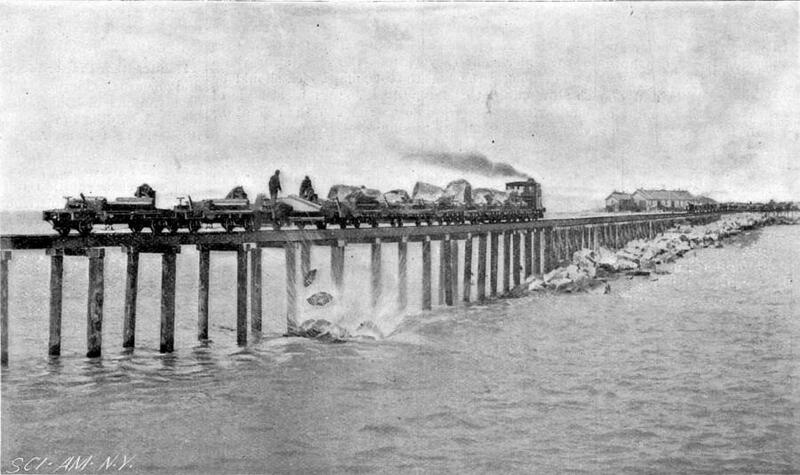 Jetty A, at 0.9 mi., the smallest of the three jetties at the mouth of the Columbia River, cost $20 million; while the 2.5-mi.-long N. Jetty is expected to cost $30 million. Specifications for the S. Jetty, which juts 6.3 mi. out to the sea are still being designed. 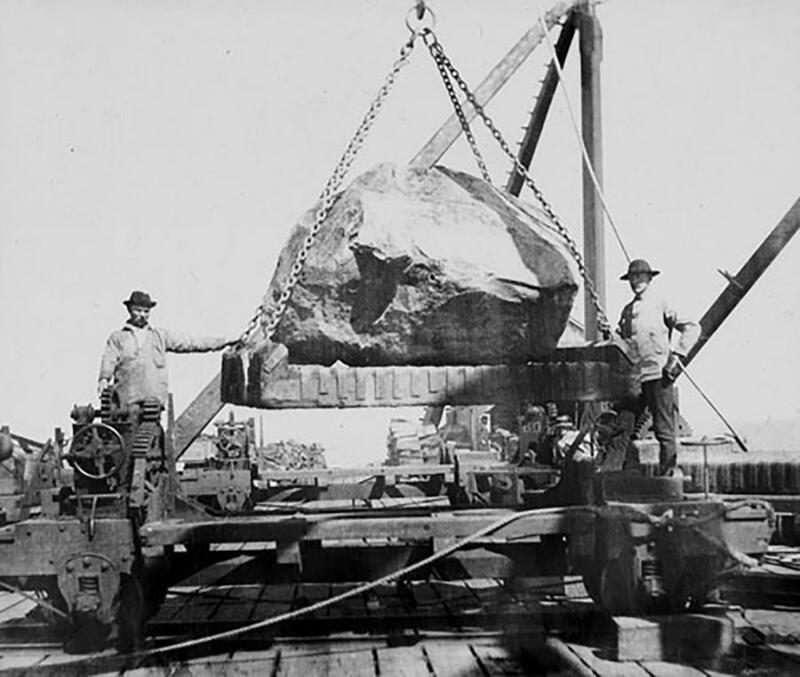 Armor stones weigh anywhere from four to 38 tons each, Otto said. "We require the contractors to individually place these armor stones. There are multiple quarry sources from Washington into California along the Pacific Coast that produce a basalt type of stone that has a good density to it. We don't really use granite because granite is less dense than basalt. Sometimes it has to come from several hundred miles away." Some quarries use geophysical investigation to help determine how to blast the rock, while others work solely from experience and an understanding of the terrain. 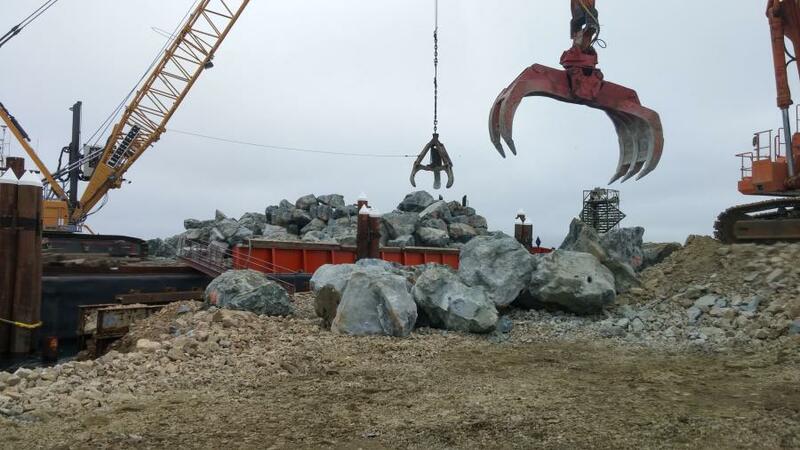 Once the stone is available, the contractors generally truck the stone to the port, then use barges to float it to the jetty site. Larger barges can carry nearly 14,000 tons, the equivalent of 500 truck loads. "There is a tremendous amount of waste material that comes with getting those big stones," Otto said. "Eighty percent of the cost of building a jetty is producing the stone and shipping it. Twenty percent of the cost is placing it at the site. They have some large loaders, like the Cat 990 loader that can lift these larger stones, and Cat 773 haul trucks that they use to haul the stones. If they are delivering by land, they use low-boy semis. That's mostly what the public sees. 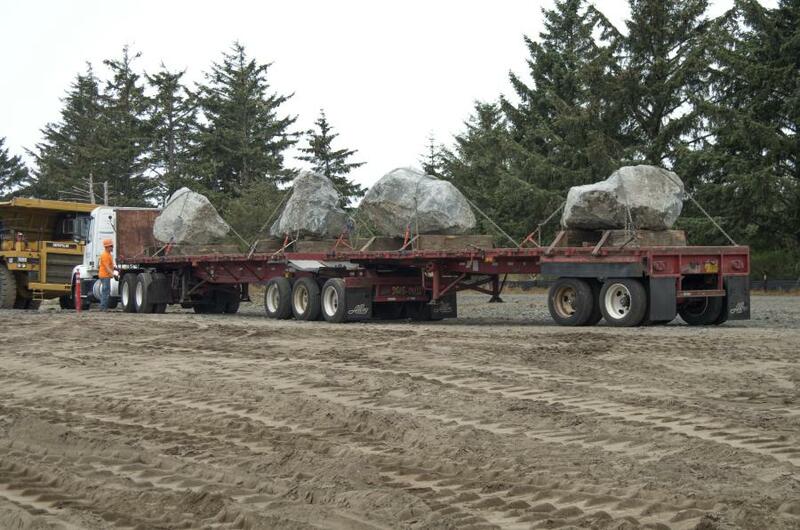 On some of those stones, the ones up to 30 tons, there is just one stone per truck. The stone sizes will vary. The bigger ones will go where the sea is roughest. Smallest, at root of jetty connected to land." The armor stones are carefully placed and must have contact at the side, top and bottom of the stone next to it, he said. "It's a jigsaw puzzle. It doesn't go very fast. When you are trying to get something to last 50 years in those conditions out there you are going to take the time to do it right." Jetties at the mouth of the Columbia River: Jetty A has been completed, the North Jetty is under construction and the Corps anticipates releasing requests for proposals for the South Jetty rehabilitation project in winter 2018-2019. The current estimated stone quantity for South Jetty is 360,000 tons. Of this quantity, approximately 30 percent will be high-density stone with a minimum unit weight of 180 lbs/cu.ft. The stone placement period of performance will run five years through October 2024. 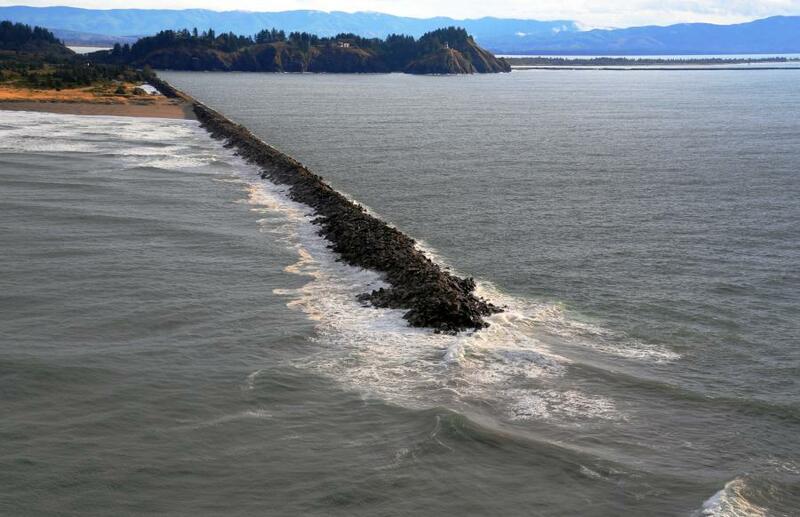 Tillamook Jetties: The Corps has contracted out an engineering report to further develop the repair design for the South Jetty and a portion of the North Jetty at the root. The Corps currently anticipates releasing requests for jetty repair sometime between fiscal year 2020 and 2022, dependent on funding availability. The current planning estimate for stone quantities ranges from 80,000 to 120,000 tons depending on rate of jetty degradation and final design. High-density stone (greater than 175 lbs. per cu. ft.) is expected to be required for at least 1/3 of the stone volume. Coos Bay North Jetty: The Corps will complete an engineering design report in fiscal year 2018 to further develop the repair design for the North Jetty Head, Jetty Root, and shoreline fill along Log Spiral Bay. The Corps currently anticipates releasing requests for jetty repair sometime between fiscal year 2020 and fiscal year 2022, dependent on project sequencing and funding availability. The current planning estimate for stone quantities is approximately 100,000 tons depending on rate of jetty degradation and final design. High-density stone (greater than 175 lbs. per cu. ft.) is expected to be required for 10-15 percent of the total stone volume. Port Orford Jetty: The Corps received funding in fiscal year 2018 to award the construction contract for the breakwater repair. The Corps currently anticipates releasing requests for proposals for the Breakwater repair in first quarter FY19. The current planning estimate for stone quantities is 25,000 to 30,000 tons of new jetty stone procurement and placement. High-density stone (greater than 175 lbs. per cu. ft.) is expected to be required for at least half of the stone volume.